Every year, sometime after our Eastham family reunion on the second Saturday in June, it has been our practice to take a road trip: my mother, my sister, and me. Several of our trips covered bits of the Blue Ridge Parkway. We even stopped by Dollywood one summer and liked it way more than we expected. Always, as soon as we were on the highway, Mom would sing "On the road again . . ." She was always excited to take a trip. My sister says if you called and ask her to take a trip she would be standing at the curb with her bag packed before you hung up. Mom was game for anything. Several years ago she rode the highest roller coaster in the world (at that time) at Cedar Point with my son Jamie and me. Recently Lynn and I took her up Grandfather Mountain to stand on a metal bridge in a storm, just because we always wanted to do it, and this was our chance. 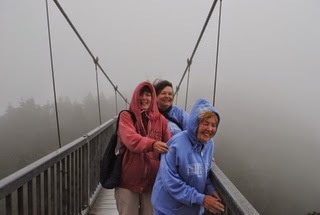 Mom, Lynn, Judi: Mile high swinging bridge, Grandfather Mountain, North Carolina. 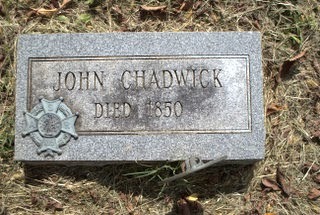 John Chadwick was born some time around 1760. He was living in North Carolina when the Revolutionary War broke out around him. His father's house was burned, and John joined the army. 5 September 1836. Declaration of John Chadwick, County Court, Greenup, Kentucky. John Chadwick took part in the Battle of Guilford Courthouse on March 15, 1871 a crucial battle of the Southern Campaign. Although Major General Nathaniel Green and his 4,500 militia and Continental troops were forced to withdraw by a smaller army led by Lord Cornwallis, it was at a huge cost to the English army. The battle broke the tide of the British in the Carolinas; Cornwallis withdrew to Virginia, where he surrendered at Yorktown that October. After the war John moved to Kentucky. On 12 March 1796, in Paris, Bourbon County, he married Kerenhappuch Shortridge, the daughter of George Shortridge and Margaret Muir. The couple raised a family of twelve children in Greenup County, Kentucky. After Kerenhappuch's death on 17 May 1840, John married the widow Lucinda Bartrum. Both John and his widow Lucinda received a pension based on his service in the Revolutionary War. John died on 4 April 1850. 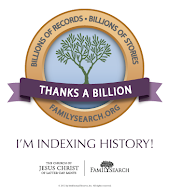 John was buried in a family cemetery on land along the Big Sandy River in Greenup County. The Ashland Oil Company purchased the land and numerous graves were moved from the original cemetery. The original tombstones were removed, but were not placed in the new location. 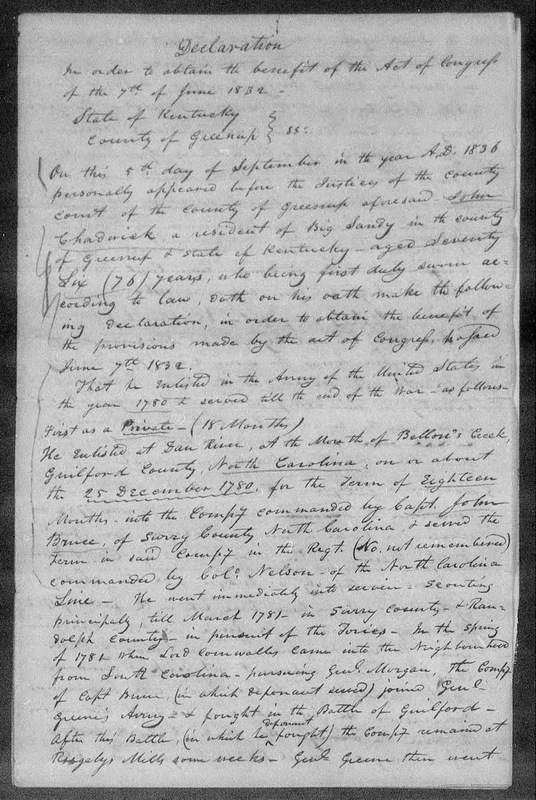 images from Revolutionary War Pension and Bounty-Land Warrant Application Files, NARA M804, no roll number given. 3. Bourbon County Marriage Register, County Clerk, Paris. 4. "John Chadwick Family Bible 1797-1821, "Tree Shaker, Vol 3, # 1, winter 1979; transcription John Chadwick Family Bible by Doris C Miller. 5. John Chadwick pension file. 6. John Chadwick pension file.